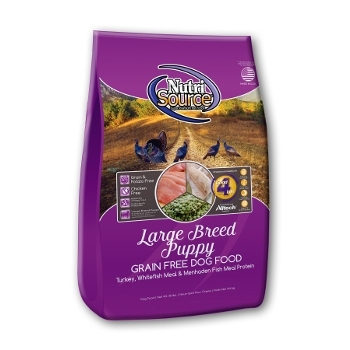 NutriSource® Chicken & Pea Formula Grain Free Dog Food is made with delicious chicken as the #1 ingredient that features excellent palatability, digestibility, and taste dogs love. NutriSource® Chicken & Pea Formula Grain Free features the NutriSource® exclusive “Good 4 Life” system and is made with the finest quality ingredients available. 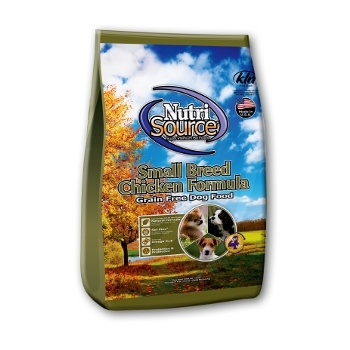 NutriSource® Small Breed Chicken Formula Grain Free Dog Food is made with delicious chicken as the #1 ingredient that features excellent palatability, digestibility, and taste dogs love. NutriSource® Small Breed Chicken Formula Grain Free features the NutriSource® exclusive “Good 4 Life” system and is made with the finest quality ingredients available. NutriSource® Large Breed Chicken & Pea Formula Grain Free is made with delicious chicken as the #1 ingredient that features excellent palatability, digestibility, and taste dogs love. The large breed kibble size satisfies large and giant breeds appetite for chewing and taste. 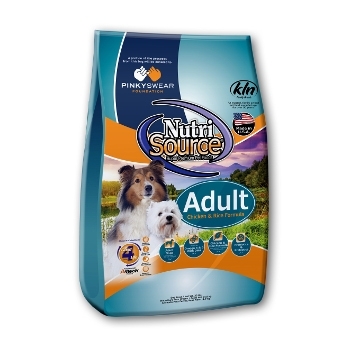 NutriSource® Large Breed Chicken & Pea Formula Grain Free features the NutriSource® exclusive “Good 4 Life” system and is made with the finest quality ingredients available. 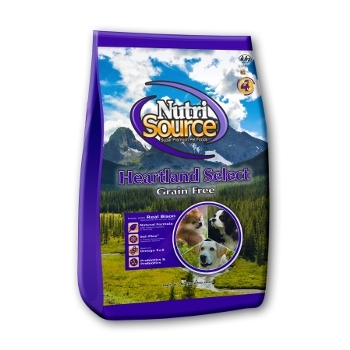 NutriSource® Heartland Select Grain Free Dog Food is formulated to meet the nutritional levels established by the Association of American Feed Control Officials (AAFCO) Dog Food Nutrient Profiles for all life stages. 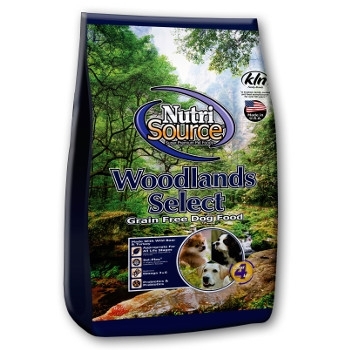 NutriSource® Woodlands Select Grain Free is made with delicious Boar & Turkey as the #1 ingredient that features excellent palatability, digestibility, and taste dogs love. 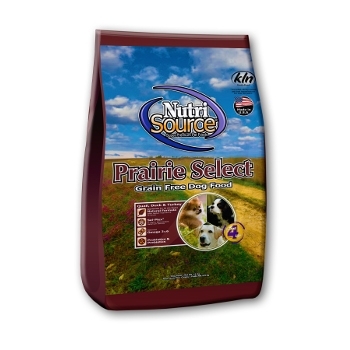 NutriSource® Woodlands Select Grain Free features the NutriSource® exclusive “Good 4 Life” system and is made with the finest quality ingredients available. 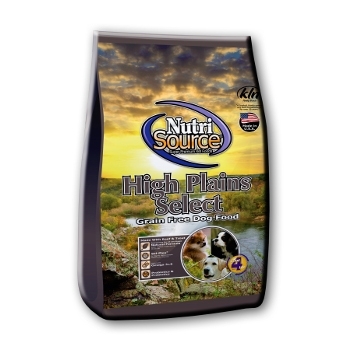 NutriSource® High Plains Select Grain Free is made with delicious Beef & Trout as the #1 ingredient that features excellent palatability, digestibility, and taste dogs love. NutriSource® High Plains Select Grain Free features the NutriSource® exclusive “Good 4 Life” system and is made with the finest quality ingredients available. NutriSource® Lamb Meal & Peas Formula Grain Free is made with nutritionally superior lamb meal that features excellent palatability, digestibility, and taste dogs love. NutriSource® Lamb Meal & Peas Formula Grain Free features the NutriSource® exclusive “Good 4 Life” system and is made with the finest quality ingredients available. 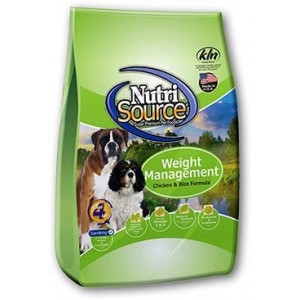 NutriSource® Weight Management Chicken & Rice Formula provides super premium nutrition in a scientifically formulated easy-to-digest food designed for maintenance of less active adult dogs that may tend to gain weight and also for overweight dogs. 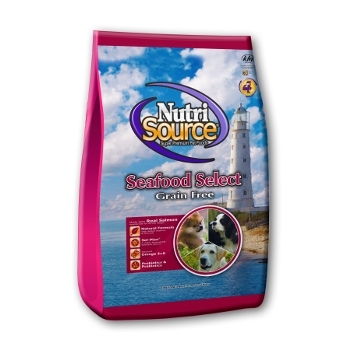 NutriSource® Seafood Select Grain Free is made with delicious Salmon as the #1 ingredient that features excellent palatability, digestibility, and taste dogs love. NutriSource® Seafood Select Grain Free features the NutriSource® exclusive “Good 4 Life” system and is made with the finest quality ingredients available. 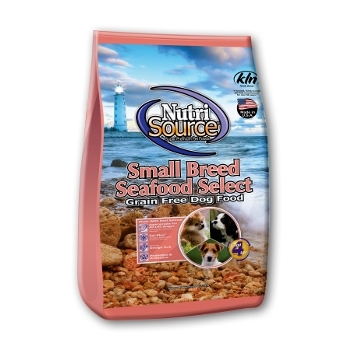 NutriSource® Small Breed Seafood Select Grain Free is made with delicious Salmon as the #1 ingredient that features excellent palatability, digestibility, and taste dogs love. NutriSource® Small Breed Seafood Select Grain Free features the NutriSource® exclusive “Good 4 Life” system and is made with the finest quality ingredients available. 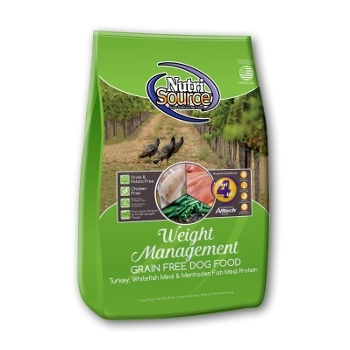 NutriSource® Weight Management Grain Free Turkey, Whitefish Meal & Menhaden Fish Meal Protein provides super premium nutrition in a scientifically formulated easy-to-digest food designed for maintenance of less active adult dogs that may tend to gain weight and also for overweight dogs. 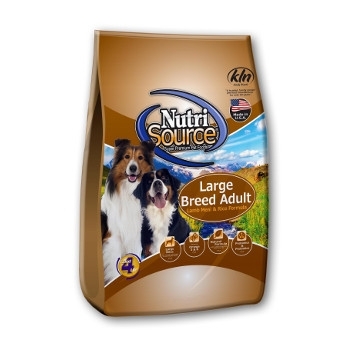 NutriSource® Large Breed Puppy Grain Free Dry Food provides super premium nutrition in a scientifically formulated easy-to-digest food designed for puppies of breeds that will mature at more than 50 lbs. 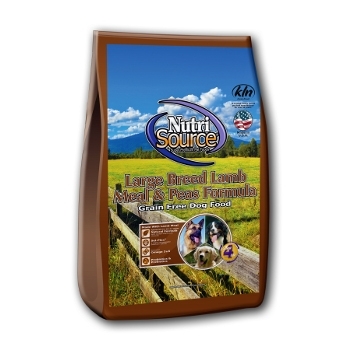 NutriSource® Large Breed Puppy Grain Free Food is formulated to provide proper nutrition for balanced muscular and skeletal growth in large and giant breeds. 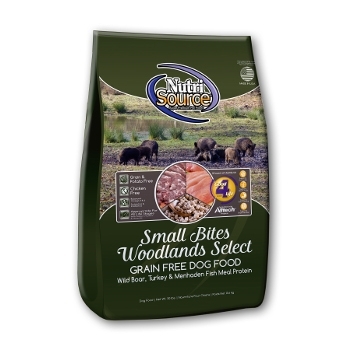 NutriSource® Small Bites Grain Free Woodlands Select Dry Dog Food is now available at Arizona Feeds Country Stores! 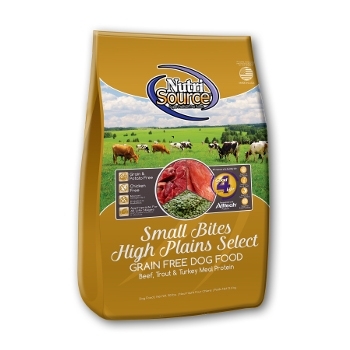 NutriSource® Small Bites High Plains Select Grain Free Dry Dog Food is here at Arizona Feeds Country Stores! This food contains Beef, Trout, and Turkey Meal Protein. 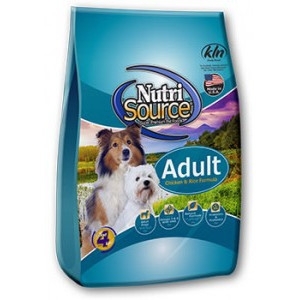 NutriSource® Adult Chicken & Rice Formula Dog Food provides super premium nutrition in a scientifically formulated easy-to-digest food. 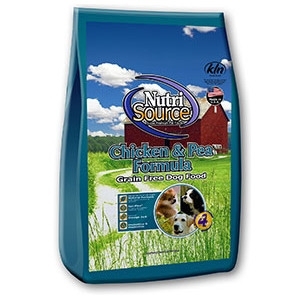 Real chicken is the number one ingredient in NutriSource® Adult Chicken & Rice Formula Dog Food. Chicken is a source of high quality protein to help maintain muscle mass and strength. 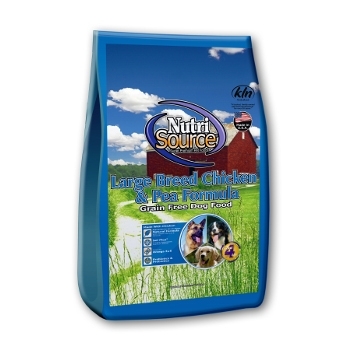 NutriSource® Large Breed Adult Chicken and Rice Formula provides super premium nutrition in a scientifically formulated easy-to-digest food designed for large and giant breeds. Real chicken is the number one ingredient in NutriSource® Large Breed Adult Dog Food. 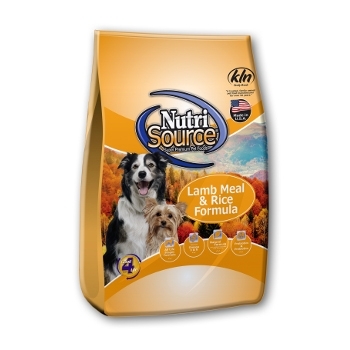 NutriSource® Lamb Meal & Rice Formula provides super premium nutrition in a scientifically formulated, easy-to-digest food. NutriSource® uses the finest quality ingredients including lamb meal as the primary source of protein and high quality rice as the primary cereal carbohydrate ingredient. The specific protein and carbohydrates are selected for their ease of digestibility. 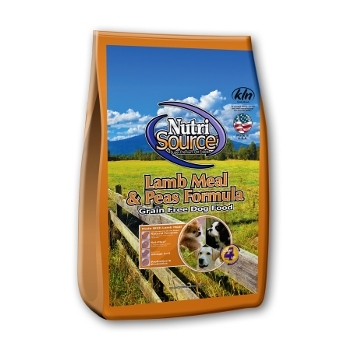 NutriSource® Large Breed Adult Lamb Meal & Rice Formula provides superior nutrition in a scientifically formulated easy-to-digest food. NutriSource® uses the finest ingredients including lamb meal as the primary source of protein and rice as the primary cereal carbohydrate ingredient to help maintain muscle mass and strength in large dogs. NutriSource® Small and Medium Breed Puppy is ideal for growing small and medium breed puppies (breeds that mature to less than 50 lbs.) and provides super premium nutrition in a scientifically formulated, easy-to-digest food. 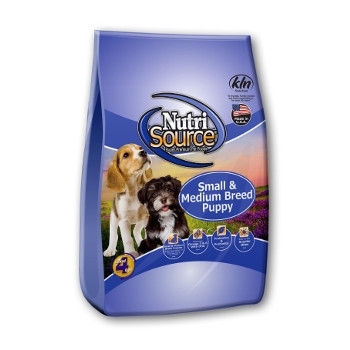 NutriSource® Small & Medium Breed Puppy contains the higher levels of protein and fat needed by small and medium breed puppies and is formed to smaller, bite size kibble making it easier for small dogs to eat. 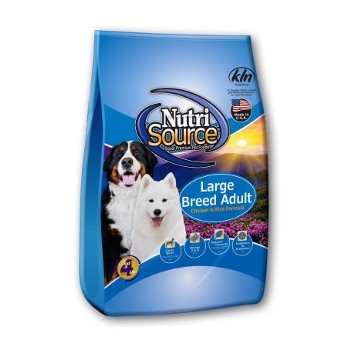 NutriSource® Large Breed Puppy Chicken and Rice Formula provides super premium nutrition in a scientifically formulated easy-to-digest food designed for puppies of breeds that will mature at more than 50 lbs. 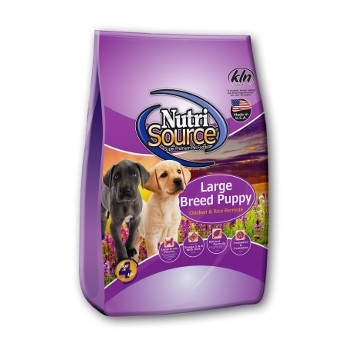 NutriSource® Large Breed Puppy is formulated to provide proper nutrition for balanced muscular and skeletal growth in large and giant breeds.